Ken Masters in his Street Fighter IV colors. Handcrafted 1:4 scale statue measures 25-inches tall! Limited edition of only 300 pieces. Flamboyant, unorthodox, and unpredictable, Ken Masters has been a part of the Street Fighter storyline as long as his best friend Ryu. 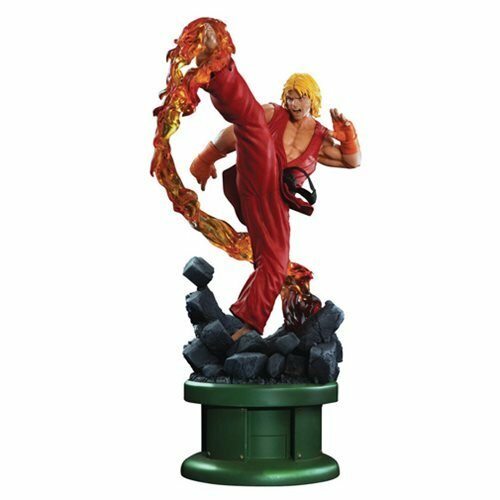 Based on his Street Fighter IV colors, this handcrafted polystone Street Fighter 4 Ken Masters 1:4 Scale Statue features his orange gloves and clean, bright outfit that pops with color, reflecting his flashy style. Measuring about 25-inches tall, he's a limited edition of only 300 pieces! Though he will never back down from a fight, by the events of Street Fighter V Ken is a married family man and has traded in his trademark red gi for the first time in franchise history. Having learned humility and found inner peace, he's even ready to become the sensei and take on a disciple of his own. But for his premiere in the 1:4 Ultra Statue line, PCS Collectibles has chosen to celebrate the 30th anniversary of Ken Masters by putting him back in his trademark togs and offering limited edition variants of his pre-SFV looks.